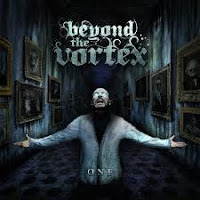 RockUnitedReviews: BEYOND THE VORTEX: "One"
"This Is War - This Is War" - Beyond The Vortex are screaming out the words 'Slayer-style' as the opening track "The Infinite Delirium" takes off like a 747 to the sky. The band's first record, "One", takes the listener on a 40-minute journey through the world of... or rather Beyond The Vortex. They materialise through a world of pain and dispear which also include earth-shattering breakdowns, relentless double-bass passages, various violent behaviour, and a barking mad vocalist. Had it not been for the fact that we actually like (old) Slayer, this record could have gone straight to the bin. It's not bad, not bad at all, the riffing - absolutely massive and I really enjoy the work of their two excellent six-string benders Simon Burri and Oskar Zekorn (now there's a comedy pair if ever - Burri & Zekorn). The downside? the technical and not to mention vocal frustrations are too many and they lose their footing as soon as Lukas Villiger goes bezerk behind the microphone stand. For fecks sake, take a breather every now and then instead of constantly trying to infuse as many words/growls as possible on each and every darn track. It's actually a blessing in the sky every time he's gone quite and you can finally begin to enjoy the melodies and crunchy guitarwork. Not for long though as it's once again back to the monotone... ehh, singing. You simply need a more diverse sounding vocalist if you're ever going to break to the masses.